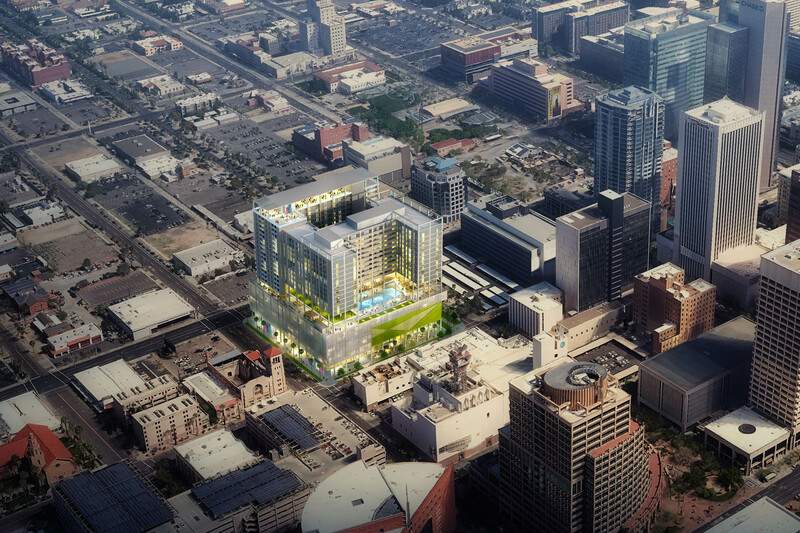 New 20-Story Residential High Rise 'X Phoenix' Breaks Ground in the Downtown Core - Downtown Phoenix Inc. The downtown core is getting a brand new residential high rise. After the Block 23 tower, which comes online later this year, this project marks only the second apartment tower south of Fillmore Street to break ground since CityScape Residences, completed in 2014. The New York-based development company, Property Markets Group (PMG), is leading the project, and began demolition on the surface parking lot and one-story building at 200 W. Monroe Street on March 11. Construction begins in June, and the new 20-story, 253-unit apartment complex, dubbed X Phoenix, is expected to open in 2021. X Phoenix, which is part of PMG’s X Social Communities brand, will cater to young professionals looking to live close to employment, transit, arts and entertainment. Crescent Ballroom, Orpheum Theatre and State 48 Brewery are all within a one-block radius. “The renaissance happening in Downtown Phoenix matches all the trends we seek in terms of demand for affordability, convenience and community,” said Brian Koles, brand and experience director for PMG’s X Social Communities. The co-living, shared apartment concept is a first for Phoenix, and a relatively new development trend nationwide. According to Koles, the shared spaces will be constantly activated to connect neighbors, while still facilitating bedroom and bathroom privacy, convenience, and perhaps most importantly, rent prices within reach. Not all units are shared, a number will be private, but it gives tenants some financial flexibility. The X Phoenix project is part of more than 10,000 units planned for the X Social Communities portfolio across the United States in the next five years. X Miami and X Chicago both opened in the summer of 2018, and X Las Olas in Fort Lauderdale and X Denver are slated to open in 2020. Additional projects are in the works in Orlando and Oakland. In its 28-year history, PMG has developed more than 150 real estate projects, focusing on luxury residential properties, including one of the tallest in Manhattan — 111 W. 57th Street.